Since 1995, we D.P. Engineers established ourselves as a prominent organization of the market by manufacturing, trading, retailing and wholesaling a wide array of AHU Filter, HEPA Filter, Evaporative Cooling Pad, PVC Fills etc. Offered products are manufactured from high-grade input factors. Our offered products are highly admired by the customers for their easy to use, low maintenance, light weight, corrosion resistance and longer service life. Apart from this, one can avail these products at reasonable prices within the limited period of time. We have constructed a highly advanced and well-equipped infrastructure unit. Our manufacturing unit is equipped with all the required machines and tools. For the streamlined execution of our business operation, we have separated this infrastructure unit into various functional parts like manufacturing, quality, warehousing and R&D. Also, we have hired a team of qualified professionals to handle all our business process. We have recruited our team after checking their working experiences and knowledge. 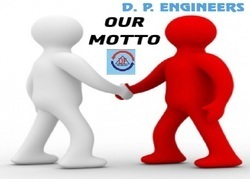 Apart from this, we offer our products under the DP engineer Brand name across the market. Under the direction of our mentor Mr. D P Sharma, we are able to famous in the market. Owing to his experience and deep knowledge, we are increasing our reach in this domain. Our Infrastructure Leveraging on our latest infrastructure facilities, we are able to offer a wide gamut of products. We have divided our infrastructure into different departments like procurement, manufacturing, quality-tasting and sales & marketing, etc. Further, each of these units is equipped with the contemporary and advanced machines that help our professionals to carry out the entire process in an efficient manner. All these units are handled by our professionals who have rich industry experience in their respective domain. To supply high-quality products to a global market, on time, giving value for money with fast manufacturing lead times. We, D.P. Engineers are a reputed name for Manufacturing Variety of Air Filters & Air Conditioning Related Components. By providing clean air solutions to a large number of customers from power generation, refineries & petrochemicals, engineering, pharmaceuticals, food, beverages and allied industries, we have earned recognition in the market. Our company works under the leadership of Mr. D.P. Sharma. 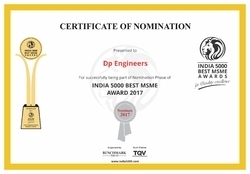 To become a world class process engineering company, recognized and respected for innovative skills and as a company where we all work in a dynamic, proactive, professional way, together as a team, to create delighted customers. V – Variety of equipment as per customer requirements and space available. I – Improvement of products with the latest technology. C – Commitment to quality. T – Timely delivery of equipment. O – Open for suggestions and innovations. R – Research and development of new products. Y – Yes for any challenge, i.e. design and development of products as per customer demand. qualified and experienced design team, with help of latest selection software for coil and fans, so that you get the best AHU in the Market.We provide you “low leak cabinet” design which you are providing cooled air to the intended space only. Our organization has carved a niche for ourselves in the market only due to the support our highly skilled and experienced professionals. These professionals give their best in the manufacturing of these premium quality products as per their exact requirements. Our professionals are well-aware according to the market trends, which help us manufacture our product range as per the international quality standards. We also conduct different training sessions on a regular basis that assist them to understand and fulfill ever-growing demands of clients.